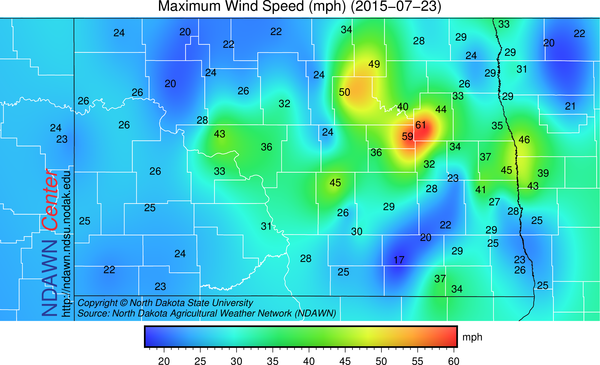 Northeastern North Dakota has tended to be the “bulls-eye” for rainfall in the past three weeks and that was the case once again with the thunderstorms from overnight. One to two inches of rain was common in that area. 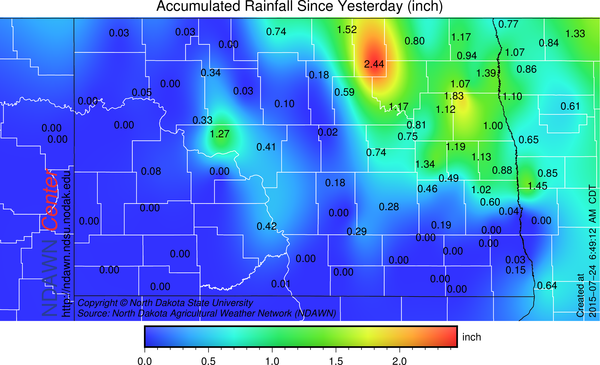 Elsewhere, with the exception of the NDAWN (North Dakota Agricultural Weather Network) northwest of Garrison, North Dakota, rainfall amounts were generally light with many locations in southern North Dakota not recording any measurable rain. That thunderstorm activity that did have strong wind gusts associated with it with some crop damage has now moved well to the east of the area and no more rain is foreseen for today. The thunderstorms that redevelop today should form well east of North Dakota and northwestern Minnesota, therefore the day is expected to be dry. Some thunderstorms will form in South Dakota later today into tonight and a similar scenario is expected in South Dakota later Saturday into Saturday night, but outside of the hard to forecast isolated event, the weekend looks dry and warm in North Dakota. The weekend is expected to bring back that heat from Thursday after a slightly cooler day today (Friday). 85° to 90° weather both days with perhaps an isolated storm, but overall, generally dry conditions expected with a greater threat of additional thunderstorms arriving Sunday night through Monday Night (there may be two waves). High temperatures still quite warm on Monday, then a cooler conditions expected Tuesday and Wednesday. That cooler air will also mean a temporary end to the higher dew point (“humidity”).